The Indiana Standardbred Association is now accepting nominations for the 2019 Board of Directors. Nominations are due by Friday, Aug. 24, 2018. Applications for the ISA Board of Directors for 2019 are due by Friday, Aug. 24, 2018. Call the ISA Office at (800) 565-5725 for more information. Candidates for the ISA Board must be willing to donate significant amounts of time for the benefit of the Indiana horsemen and horsewomen. There are four positions to be filled for 2019, including one for the northern district, one for the central district, one for the southern district and one at large. 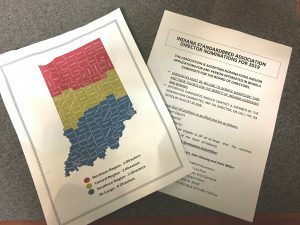 The at large position must be filled by a resident of the State of Indiana. To nominate an individual or to submit an application, contact the ISA office at (800) 565-5725 or contact any ISA Director. The ISA Nomination committee includes Jeff Cullipher (chair), John DeLong and Alvin Miller. To submit an application by mail, send an application to: The Indiana Standardbred Association, 311 American Legion Place, Greenfield, IN 46140 or by fax at (317) 462-7240.